Streetwear brand Noah has had enough with the Republican Party and its presumptive nominee Donald Trump. 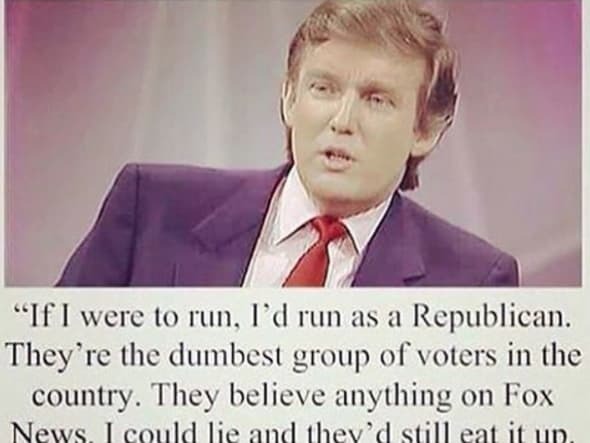 The brand posted a picture on Instagram with a (fake) quote from Trump in which he calls Republicans the "dumbest group of voters." While the Instagram caption acknowledges the fabricated nature of the quote, it adds, "But we don&apos;t support his brand of madness." We posted this because we don&apos;t support Trump. We know its fake, but we don&apos;t support his brand of madness. It&apos;s an embarrassment that he is even an option as candidate for president. For those of you in the comments who said you feel strongly enough to not shop with or support us, we will gladly accept your Noah merchandise back for a full refund. And Noah is willing to put its money where its mouth is. The brand says that it is willing to give a full refund to those who feel strongly enough about the brand&apos;s opinion to no longer shop with it. "For those of you in the comments who said you feel strongly enough to not shop with or support us, we will gladly accept your Noah merchandise back for a full refund." It&apos;s a strong—and welcome—stance from a popular brand. But maybe we shouldn&apos;t be too surprised considering Noah designer Brendon Babenzian was creative director at Supreme, another brand that isn&apos;t afraid to make political statements.